For better or worse, Google's up and coming products have been leaking like crazy in 2018, killing all the suspense and making up for rather anti-climactic announcements. It would seem that what's expected to be Google's next phone, the mid-range Pixel 3 Lite, would share the same faith as the announced device popped up in Russia, where it got the hands-on treatment and was compared with some of the more popular phones around the world. The Internet might have gone a little bit overboard with the egg hunt surrounding the heavily-rumored Google Pixel 3 Ultra, which was universally lauded as the flagship to end all gadget rivalries in late 2018 and be the digital messiah of the tech-savvy powerusers. After a very off and illogical teaser that many interpreted as Google hinting at the possible existence of a Pixel 3 Ultra, it quickly became clear that this elusive devices was as real as Half-Life 3 ever was. Well, the Pixel 3 Ultra might not be real, but it seems the Pixel 3 Lite (codenamed Sargo) which popped up a couple of days or so ago is very, very real. Russian website Wylsa, which was behind some of the bigger Pixel 3 leaks earlier this year, is back at it again with yet another major leak, this time regarding that Pixel 3 Lite. 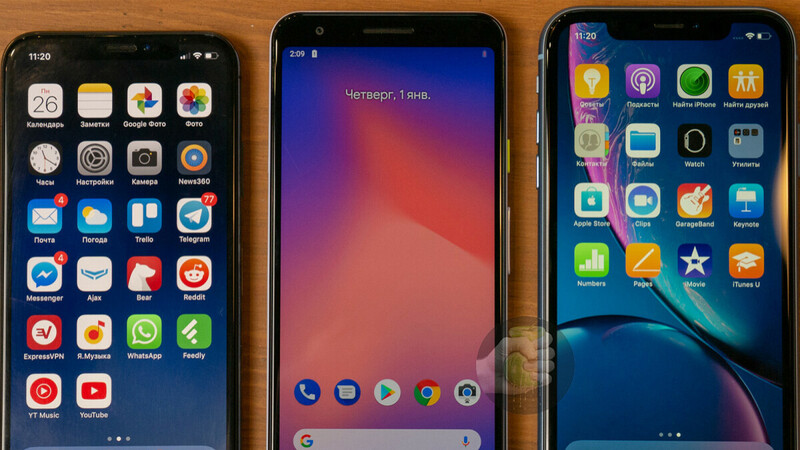 The media outlet has somehow got their hands on a retail unit, which promptly led to an improvised hands-on with the mid-range Pixel and comparing it size-wise with a slew of other popular phones. As you might have already seen from our previous coverage on the topic, the Pixel 3 Lite is powered by a mid-range processor, which is something new for Google. The device is reportedly powered by a Snapdragon 670 chipset and boast 4GB of RAM alongside 32 gigs of native storage, no microSD card slot, and a 2,915mAh battery on deck. Size-wise the Pixel 3 Lite is pretty similar to the iPhone XR despite having a much smaller, 5.6-inch display - this can be attributed to the more traditional design of the new Google device, which doesn't employ a bezel-busting appearance. The relief, however, is the fact that the Pixel 3 Lite is seemingly packing all the hardware and software camera prowess available in the regular Pixel 3 and the Pixel 3 XL forerunners, which could be a very big selling point of the Pixel 3 Lite. It doesn't take a genius to realize that Google is seemingly working on an iPhone XR rival of its own - albeit a little belated, it could potentially be a well-done mid-ranger from a well-known company that would bring a lot of value to the mid-range scene. However, everything is in the realm of rumors at this point, so we should promptly wait for the official announcement if and when Google decides the time is nigh. You can check out some of the hands-on shots Wylsacom produced right below. The design is so 2015. This better be a 300 dollar device. I like it. Small, no frills....and if it has the same camera as the Pixel 3 I'll buy it right up. I would too, if they bother selling it in the US. It's not small. Same height as an iPhone 8+, and almost as tall as a Pixel 3 XL. I agree with the rest. Yep, for that reason, I'm good. The fact that it is taller than the X makes it a no go for me. This is anything but small. I had hope when the first photo compared it to the original Pixel, but that's definitely the Pixel XL. Not the phone for people looking for a "small" android phone. This phone is too tall for the screen size. Not that I expect a cheaper "Lite" phone to be bezel-free, but it should be the same size as the smaller Pixel 3. The main selling point for the Pixel line for me is the Camera and stock Android. Everything else I'm indifferent about. A retail unit would have a 'G' on the back, not a 'C'. Fake news.